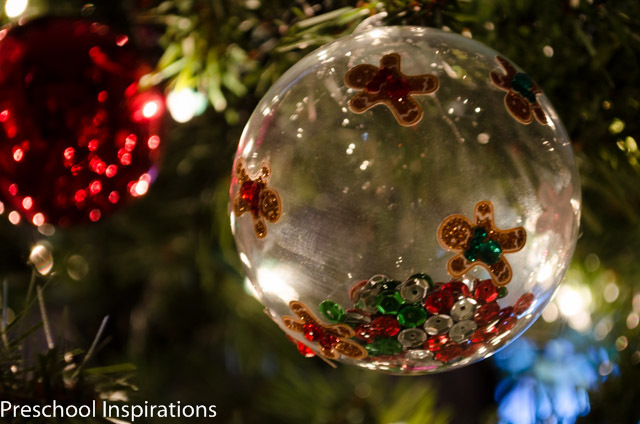 Need the perfect Christmas ornament that children can make by themselves? 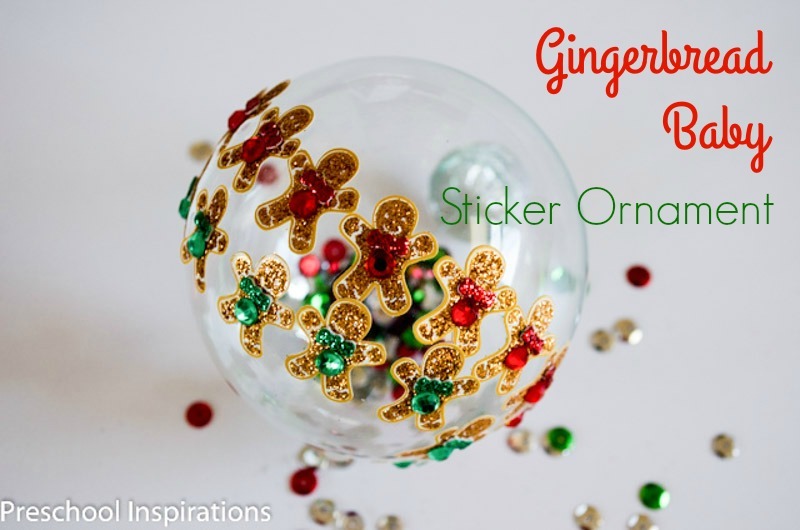 This Gingerbread Baby Sticker Ornament is perfect, and even toddlers can make this! Once December hits, there’s no denying my gingerbread adoration! This year my kids made these gingerbread baby Christmas ornaments, and we absolutely love them. We were inspired by the book Gingerbread Baby which is written by Jan Brett. It is my all-time favorite gingerbread book because of the fun story and the stunning pictures. It is definitely a “have to read” read aloud book for the Christmas season! Even when I worked in a program where we did not celebrate holidays, it was still fitting and always dearly loved. Our gingerbread ornaments are the brilliant idea of a family child care friend of mine named Kelly. I just love these because children can make these pretty much on their own even, at the older toddler age. Here’s how you can make your own too! The book, Gingerbread Baby , of course! I bought the scrapbook stickers from a local craft store, and they were super affordable with a coupon! I’ve included a link above in case you don’t want to go on a wild goose hunt. 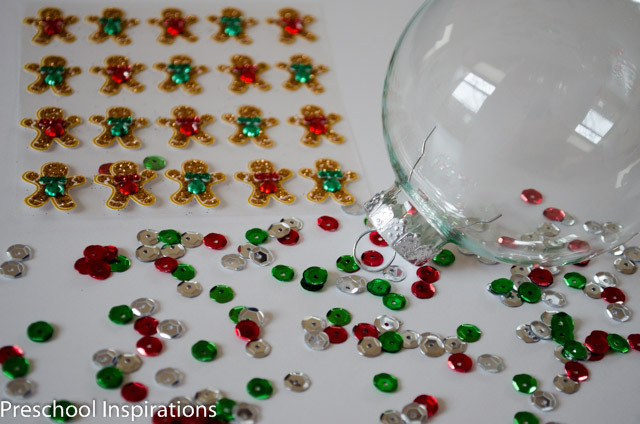 I recommend using plastic ornaments opposed to glass because then you don’t have to worry about broken glass if one rolls off the table (which is bound to happen). 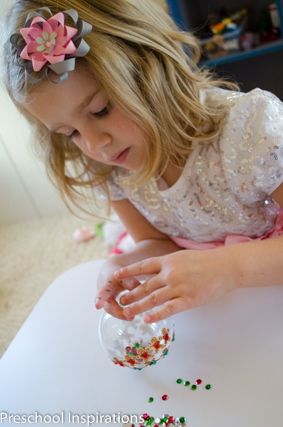 Children should be supervised while making these (as with any activity), but it is really such a cinch. Let the children put the gingerbread baby stickers on the outside. Then have them fill the inside with sequins. These are already well-loved, and I can’t wait to pull them out each year. You’re so sweet, Laura. I also love the sparkles :). love that they are shakable – that’s my favorite part! Thank you, Melissa! Ornaments can be so versatile :). Thanks for hosting this wonderful series! I love gingerbread and this is so cute and easy to do with very young children I love it and will have to hunt some of those stickers out.